The female percentage of the population in Ahmednagar district is increased due to the consistent and coordinated efforts of Snehalaya and govt. agencies. Last year's survey, since June 2011, reported the ratio of female births at 813 per 1000 males. This year in the official survey of April, May and June 2012, the number of female births was found increased up to 850 against 1000 boys. These statistics were officially announced by Mr.Ashok Pawade, Dy.CEO of Ahmednagar Zillah Parishad on 11 July, 2012. 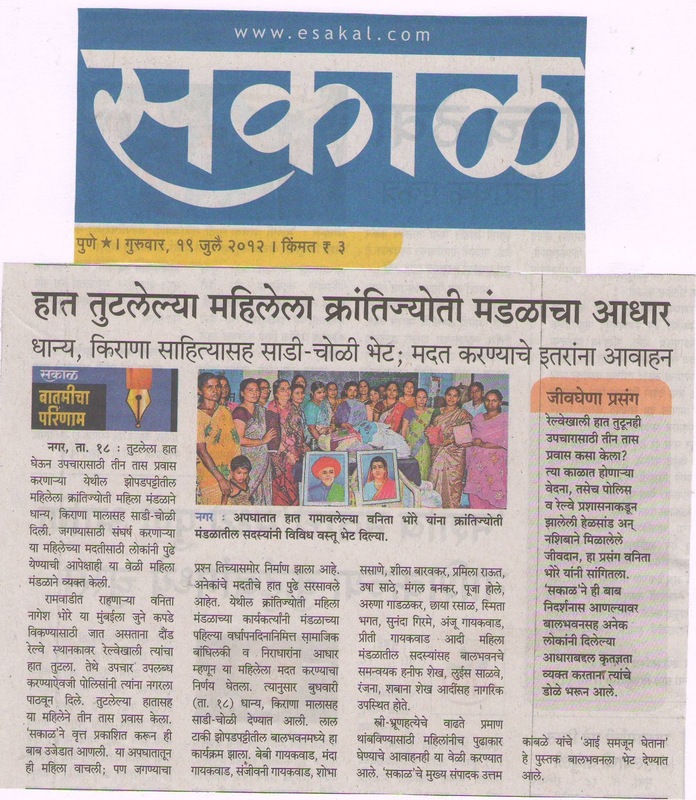 Snehankur Adoption Centre had organized a felicitation ceremony on today at Snehankur Centre. The NGO has respectfully invited those who have played the conscious roles in converting conventional efforts into an encouraging success story. Dr. Ravindra Niturkar (Dist. Civil Surgeon ), Mrs. Vaishali Shinde (Dy.Police chief), Dr.Priti Deshpande, well known social worker, and many others were present as chief guests to celebrate this success on the occasion. Dr.Niturkar said that , mainly the "Stree Bhrun Hatya Mukta Gaon Abhiyan" (People's Movement to make a village free from female feticide) by Snehalaya -Snehankur, the strict implementation of PNDT Act, the schemes by Gram panchayats like depositing 2000 rupees in the name of female immediately after her birth, the get-together program of pregnant women at village level, etc. have proved as very effective measures in changing the trend. Government agencies alone cannot face the complex social challenge of female feticide but it needs the active involvement of NGOs and society to fight the social evil of female feticide. Snehalaya and Snehankur volunteers have reached out to grass roots with positive messages. This movement is working 24 x 7 and also saves the underweight and premature girl children who were the victims of social customs. "These efforts need no money but a strong will power for social change," Dr.Niturkar said. 4 Children get their Mummy & Papa…..
On this occasion, 4 children were given in adoption to families by Snehankur Adoption centre .Out of these 4 kids, 3 were girl children. They are the survivors as their lives were saved after the attempts of feticide. They were underweight and premature when saved by 'Team Snehankur.' Mr. Ajay Wable concluded the function by giving a pledge to all to save the girl child & to work hard for achieving the goal of an equal male to female ratio by the end of 2015 in Ahmednagar district. 20 volunteers who had contributed in this mission were also honored at the occasion. Rahata tehsil is famous due to the international pilgrim centre of Shirdi. The female ratio in Shirdi-Rahata area is just 758 . Sangamner is the tehsil of state revenue minister Balasaheb Thorat where the percentage is 752. Shrigonde is the tehsil represented by Dist. Guardian Minister Mr.Babanrao Pachpute of NCP. Here the percentage is 804. In shevgaon-820, Rahuri-814, Karjat-922, Jamkhed-903, Pathardi-909, Jamkhed-903, Shrirampur-912. Akole is the tribal, socially-economically-educationally backward tehsil of Ahmednagar district. Here the female ratio is 952, found much better than other well-off tehsils. "Snehankur has decided to concentrate more on Shrigonde, Rahata, Rahuri, Sangamner and Shevgaon tehsils in the next 2 years," informed Kundan Pathare, Asst.coordinator of Snehankur Adoption Center. He urges every citizen to step forward to stop female feticide & help in empowering the girl child in every possible way. "The action must begin at home, in our families, in our communities," he added. Two smiling girls shyly showed their mark sheet. They had cleared their P.A. exams with 75% and 72%. At a very basic level, the difference between a PA and a nurse is that a physician assistant is trained to diagnose and treat medical illnesses, although under the supervision of a physician, while a nurse primarily provides nursing, or bedside care. One of the girls (aged 18) had come to Snehalaya 6 years ago after the death of her mother. She has a younger brother who also lives at Snehalaya. Her dad was not able to take care of the kids after his wife’s death and as a result handed over the children to Snehalaya. He regularly comes to visit the kids. They were tested HIV+ after coming here. She enjoys dancing and writing in English. Her aim is to pursue further education and secure a good and stable job. The other girl (aged 17) came to Snehalaya in 2009. She has an elder sister who is married now and a younger brother who lives at Snehalaya. Her parents died due to AIDS. After that, her brother and she were rehabilitated at Snehalaya. She enjoys Indian art forms like rangoli and mehndi. Her aim is to work at Snehalaya for the unprivileged people. These girls are unique. In spite of being HIV+ and coming from a poor background they have worked diligently. Both of them are happy and have dreams and hopes which they are eager to fulfill.